Directions are easy in the plains. It's flat and all the towns in the plains are easily identified by a giant water tower with the name of the town on it. Somehow we still managed to get lost. However, we did find the giant TOPEKA water tower this afternoon. 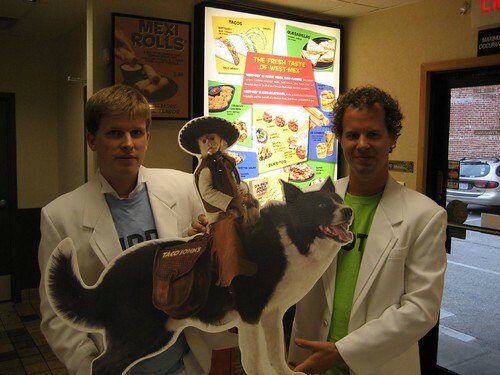 We celebrated our new image with a little trip to Taco John's. I'm skeptical about the name "Taco John's", doesn't sound very Mexican. Maybe "Taco Juan's" would be better? I dunno, John doesn't really imply any Mexican or other south of the border images. Apparently this cut-out cost $700, I doubt it, but the woman working behind the counter insisted it was. To bad, we wanted to write Kansas City on it and hit the side of the highway. Pimpin in the plains!!! I guess soon you'll be pimpin in the Ozarks. Watch out for the beef mixture that they use at Taco John's. It always makes me sick. Have you ever heard of Carlos O'Kelly's Mexican Restaurants? Only thing I can think of is that Carlos' mom married an O'Kelly. Aint it goin to be a challenge to keep those jackets clean on the road?